SIOUX CITY, IOWA — The Chicago Steel are Clark Cup Champions, winning the USHL’s championship for the first time in the team’s 17-year history. The Steel defeated the Sioux City Musketeers in overtime, 2-1, Tuesday night at Tyson Events Center, winning the best-of-five series, 3-2. Forward Tyler Gratton scored the game-winning goal 11:30 into overtime. Steel left wing Eduards Tralmaks was named MVP of the Clark Cup Playoffs. His league-leading 10th goal of the postseason tied the game in the second period. Goaltender Ales Stezka stopped 45 of 46 shots in the victory. The Steel were outshot by an 18-3 margin in the first period. With a multitude of players clogging the crease area, Sioux City defenseman Carson Vance sent a rebound over Stezka at the 11:04 mark of the first period to open the scoring. Tralmaks found the equalizer in the second period, sending a rebound of Marc Johnstone’s shot past Musketeers netminder Matiss Kivlenieks at 15:27. Johnstone and Jack Badini recorded assists on the goal. Neither team found the back of the net in the third period, as the series saw its second overtime game. On Chicago’s ninth shot of the extra session, Gratton spun in the slot and fired the Cup-clinching goal into the net for his first point of the postseason, securing Chicago’s first USHL title. The Steel became the first road team to win the Clark Cup since 2014. Badini finished the postseason with a USHL-leading 17 points (7+10). The Steel went 2-for-2 on the penalty kill and did not have any power play opportunities. USHL President and Commissioner Bob Fallen presented the Clark Cup at center ice to Johnstone, Chicago’s captain, in front of a sold-out crowd of 6,309 fans, the largest crowd in Sioux City’s 45-year history. Chicago set new all-time team records this season with 38 wins and 81 points in the regular season, making its way to the postseason for the first time in nine years, and first since the team relocated to the Fox Valley in 2015. Chicago defeated the Youngstown Phantoms in the Eastern Conference Semifinals, 3-2, before knocking out the defending Eastern Conference Champions, the Dubuque Fighting Saints, in the Eastern Conference Final, 3-1. This was the Steel’s first-ever appearance in the Clark Cup Final. 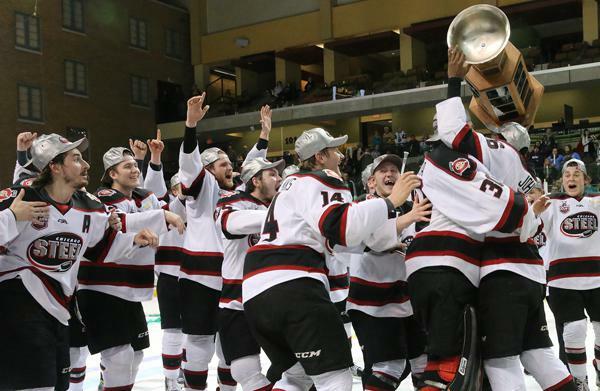 The Chicago Steel will return to the ice in October as the defending Clark Cup Champions. For more information on the Chicago Steel, visit ChicagoSteelHockeyTeam.com or call 855-51-STEEL.